Some months ago, while trawling through imdb.com, I came across a reference to Philip Seynour Hoffman’s portrayal of Truman Capote in the film ‘Capote’. As is now widely known Hoffman went on to win the Oscar for his role. I ordered the film from the U.S. before it was released in the U.K. and watched it three times within a week. Then I bought the book ‘In Cold Blood’. I read it on a trip to Austria, and when I returned to the U.K. I read it again. Then I bought the original 1967 film of the book starring Robert Blake. Then I bought Capote’s biography by Gerald Clarke and read that, specifically the sections that covered Capote’s trip to Holcomb, Kansas. If you don’t know the story it’s pretty straightforward. Capote was a social creature, a five foot three effete homosexual who took a starring role in the New York literary scene in the fifties. He was witty, charming (in fact the Queen Mother of England said he was the most intelligent and charming man she’d ever met), debonair, already lauded for his literary work in ‘Other Voices, Other Rooms’, ‘Breakfast At Tiffany’s’, numerous short stories, and his journalistic work for the ‘New Yorker’ magazine. In 1959 Capote happened to read a brief article in the New York Times about the senseless and unsolved murder of a Kansas farmer called Herb Clutter, his invalid wife Bonnie, and their two teenage children, Kenyon and Nancy. They had been killed by shotgun wounds to the face and head. Father and son were found in the basement of the family home, mother and daughter in their beds. First impressions gave no evident motive for their killings. Intrigued by this event Capote went to Kansas with his childhood friend, Harper Lee (author of ‘To Kill A Mockingbird’), the purpose being to write an article about the killings for the New Yorker magazine. What transpired is detailed in the film ‘Capote’, and the book that Capote ultimately wrote (taking six years to do it as he had to wait throughout the entire legal procedure of capture, arrest, trial, conviction, sentencing, appeals, Death Row, and ultimate hanging of the two murderers, Perry Smith and Richard Hickock). As far as novels go, ‘In Cold Blood’ is astonishingly well-written. It is so unlike anything else that Capote produced that it could have been written by an entirely different author. It is a magnificent work. The film is exceptionally tense, and Hoffman’s performance is breathtaking. 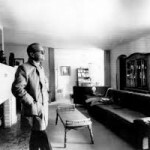 Capote remains an enigma. After ‘In Cold Blood’ (for which he received in excess of two million dollars in advance and film rights…in 1966!) Capote never completed another work. He died in 1984, aged 59, as a result of complications resulting from alcoholism. Seems that ‘In Cold Blood’ was the book he was meant to write, for the penalty he paid was his own life. Read the book, then watch the original 1967 film of the same title, then watch ‘Capote’ starring Philip Seymour Hoffman. ‘In Cold Blood’ has been lauded as one of the most important books of the Twentieth century. It changed the way people read, the way they wrote…it changed the way people understood literature. Without exception one of my personal treasures, a book that stands head and shoulders above the many subsequent attempts to copy its style and voice.